Where do cheap designer duds go once the buzz is over? 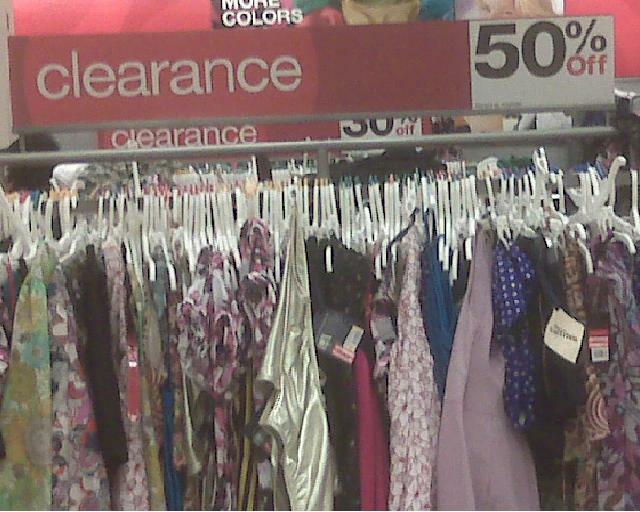 To the clearance rack, that’s where. I traipsed over to the Target store this week, after following my own advice and dropping two bulging bags of clothes at the Salvation Army on Atlantic Avenue. My Target mission was two-fold: to check out the Zac Posen collection in person, which was unveiled a week ago, and to see what was left of other recent designer collaborations, including the much-hyped Liberty of London for Target range and Jean Paul Gaultier’s collection. Well there they were, the remnants of both designers’ clothes, piled high on the clearance racks. Needless to say there was no buzz there. No styling. No huge “get it while it lasts” graphics; nary a coat hanger even for these forgotten clothes. They were crammed onto a couple of racks, hanging haphazardly or trodden underfoot beneath the 50%-off and 30%-off banners. These were the same floral dresses and saucy swimsuits that people lined up for just a few weeks ago, though admittedly the choice of sizes was limited to very small or very large. Quite a contrast from Liberty’s fanfare introduction to the masses at a pop-up store in New York, that came with an enormous ad campaign, spring flowers and even hyacinth scent wafting through the air. Jean Paul Gaultier would be no less thrilled, I’m sure, to see what’s left of his collection shoved unceremoniously onto the bargain racks. Somehow even the deep discounts couldn’t make this mish-mash of frocks and bathing suits and tunics appeal; everything looked unloved, cheap and garish. That leads me right to Zac Posen’s collection, which is still very much front and center, having been in store only since April 25. I was disappointed it didn’t show better than I expected. The fabrics had that cheap sheen; the red tulle party dress didn’t live up to my hopes; the cherry-red leather jacket, the most pricey of the clothes at just under $200, looked plastic and glaringly bright; and some of the prints were just plain tacky. Needless to say I left empty-handed and even more resolved to buy only what I love from now on. Previous PostShopping Style in ReverseNext PostThese Shoes Were Made For Talking!